Welcome to the ancient sunken city of Baiae (Parco Archeologico Sommerso di Baiae), just 30 minutes northwest of Naples. Seneca called Baiae a “resort of vice,” while Ovid referred to it as a “favorable place for love-making.” Famous for its prestigious baths and thermal springs, the ancient city of Baiae was a fashionable bathing and recreation area of the rich and famous. But today, much of Baiae is underwater. 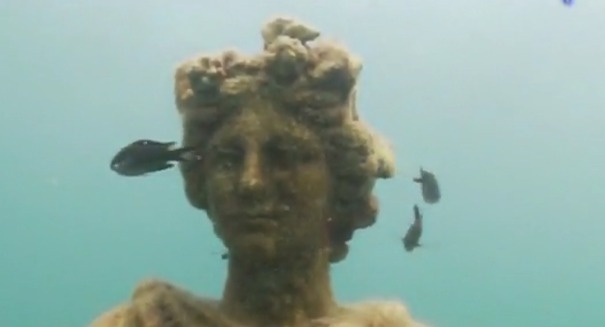 Remains of Roman streets, Imperial Villas and tottering statues lie submerged in just a few feet of water. Sea life weave in among the ruins, the only live occupants of what used to be the summer playground of the emperors. 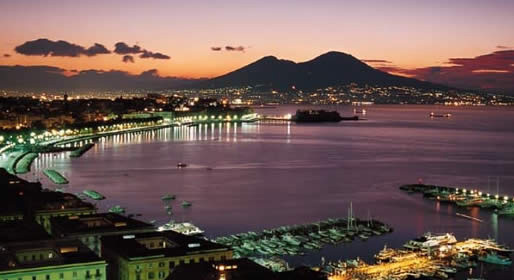 Parts of the ancient cities of Baia and Puteoli (Pozzuoli) became submerged during the 16th century when the ground sank and the sea level rose, known as bradyseism. Volcanic lava from underneath the ground found a way of escape, causing a drop in the elevation. 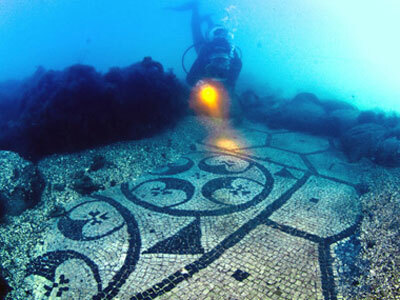 Today, hoary life-size statues tilt precariously on the sea floor, remains of ancient Roman roads lead nowhere, floors of black and white mosaic attest to a long forgotten villa, bits of ancient amphorae that once held an emperors wine are scattered across the ocean floor. The first century sunken Roman seaside resort of Baiae, built during the time of Emperor Claudius, remains today as a shrine for the fish that dart about its contours and crumpled columns. Emperors Nero, Caligula, Hadrian and Gaius Julius Caesar once owned elegant summer villas in Baiae alongside the areas famous epicurean thermal baths. Cicero entertained them during Saturnalia feasts. 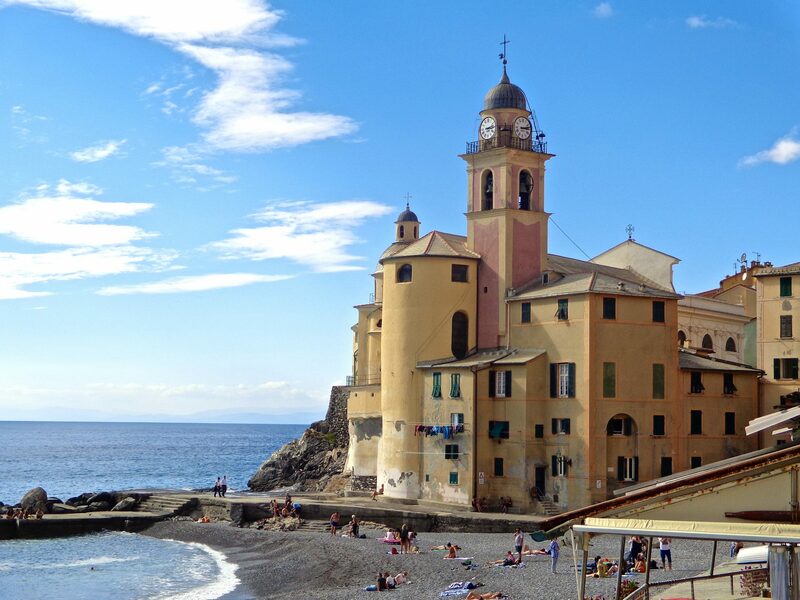 Known as the ‘Italian Riviera’ of its time, the pleasurable coastal resort gives evidence of high living. Below the surface is an ancient Roman road hemmed in by taverns, leading up to Villa Protiro and its colonnaded entrance and rooms with mosaics. Claudius Nymphaeum still remains embellished by once-elegant statues now covered with algae. Submerged Baiae is flanked by Portus Julius, Rome’s most important fleet of the time. Commissioned into existence in 37 B.C. by the famous military leader and engineer Agrippa, remains of docks, cisterns and repair workshops are evident today. 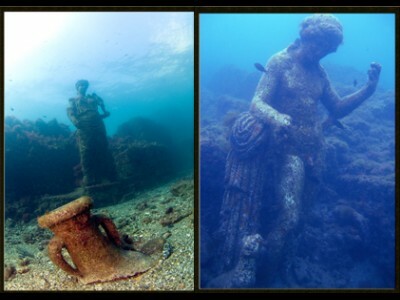 This underwater city can be observed by glass-bottom boat or scuba as well as snorkeling from the town of Baia. Some of the water over the ruins are shallow, making snorkeling a great way to get up close and personal. As a Marine Protected Area, you are sure to notice various sea life that have taken up permanent residence in the sunken city. Notice the purple sea urchins and sleek little fish darting in and around the arches and statues. Very interesting, thanks for sharing. Would love to go there in the near future. Thanks for the comment. Yes, go if you get the chance, or even better make the chance! Nothing like it…. Can earn income offering scuba safaris to site or tour subs like Atlantis IF deep enough for sub use alone. Love to tour this & pre rig underwater lighting to show ruins alone. Awesome IF Italy Tourism picks up on this alone. That would be a great idea….imagine how amazing the underground city would look! The waters are 5 to 15 feet deep so may be a bit shallow for subs. Thanks for your input.